Guesswork is not acceptable – failure is not an option. When you have people working around high tension cables and massive loads, there is no room for error. You have to have complete confidence in the strength and the accuracy of your measurement tools. While the EDXtreme may be configured for something as simple as a digital hanging scale, it offers a higher level of intelligence. With user-defined functions and sophisticated communication options, the EDXtreme readily adapts to multi-tasking operations or multi-link systems capable of monitoring a series of critical stress points from a single location — it is the definition of application versatility. 150% of capacity up to EDx-75T. - 110% of capcity Edx-100T and above. Aluminum and alloy steel capacities are powder coated. 128 x 64 dot-graphic LCD display shows up to 6 digits 1.0” (26 mm) high plus annunciators and softkeys. Digits are .11 inches (3 mm) thick for unmatched readability. Recessed sealed connector may be used for serial communications or connection to a Communicator II remote. Print or extract data easily. Continuous output can drive a scoreboard. Configurable poll character. All include certificate of calibration, manual and batteries. Plastic carry case included for EDx-1T to EDx-50T. Higher capacities include rugged plywood storage crate. Instruments with shackles include centering spacers (EDx-20T & up) and shackle storage crate (EDx-20T to EDx-75T). Display backlight. * Normal resolution mode with Dillon provided shackles. Xtreme engineering Building a precision instrument that can survive real-world punishment requires masterful engineering. This is where Dillon’s experience shines through. The engineers assigned to the EDXtreme drew on a depth of industrial application knowledge and conducted exhaustive materials testing to achieve the highest structural integrity. Superior strength and corrosion resistance – High capacity models are constructed of powder coated aircraft-quality alloy steel. Lower capacity models are powder coated aircraft-quality aluminum. 5:1 factor of safety* – This measure of strength and safety is maintained at all capacities. Computer modeling confirms the low stress and long product life that is inherent in the EDXtreme design. Retained hardware – Allows permanent attachment of centering spacers, which eliminates fumbling during high capacity rigging. Xtreme accuracy: 0.1% High resolution and accurate repeatable readings are essential to proper weighing. The higher standards set for the EDXtreme meant taking the time to ensure that material characteristics, load element design and strain gage meshed perfectly. The result of that effort is a typical accuracy of 0.1% of full scale capacity*. The enhanced resolution mode of 1 part in 5000 provides the level of readability needed for refined weighing. Wide-angle, backlit LCD – Provides improved readability over a wider viewing angle and has backlighting for low light conditions. 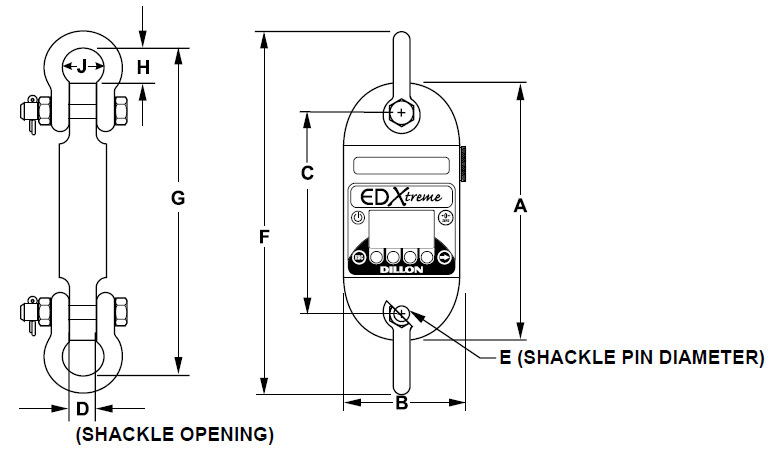 Battery operation – The EDXtreme is powered by two standard C-cell batteries. Batteries are easily accessible for fast replacement. Single network with one EDx radio dynamometer and Communicator. Single network with multiple EDx dynamometers and one Communicator. The Communicator monitors the load at each scale, plus the total weight. Single network with two, three or four Communicators. Multiple networks with multiple EDx dynamometers and Communicators. Remote control and radio communications are not new to the Dillon product line. In fact, it is the depth of Dillon’s experience in this area that led to meaningful innovations in the design of the EDXtreme and its optional remote Communicator. Improved radio performance - Unlike the many products on the market today, the EDXtreme radio dynamometer utilizes leading-edge 2.4Ghz radio frequency technology to eliminate common interference issues. This spread spectrum technology will establish and maintain the strongest, most reliable communications. Dynamic monitoring and control - The optional Communicator is an extremely powerful hand-held remote that can define the function and manage the operation of one or more EDXtreme dynamometers using wired or radio technologies. 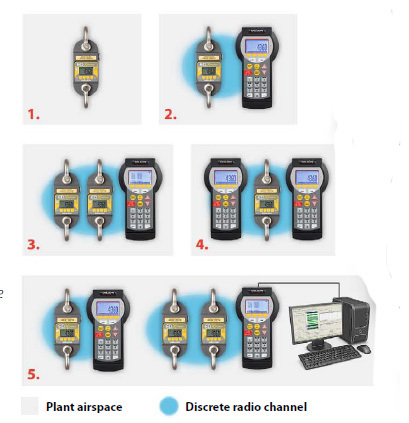 Through the programmable SOFTKEY interface, one or more Communicators can monitor multiple dynamometers within the same airspace. In multiple-link lifting arrays, the Communicator can display readings at any or all lift points and calculate the total load. Dillon on the job - Dillon force measurement equipment is the preferred choice of public utilities, nuclear facilities, tower erectors, armed services and material handlers throughout the world. In addition to the EDXtreme, Dillon’s electronic line includes the EDjunior, an exceptional value for basic applications. 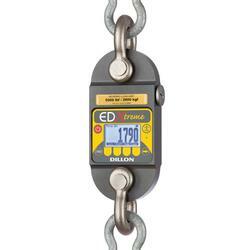 Dillon also manufactures crane scales, high accuracy mechanical dynamometers and overload protection devices. ISM 2.4 GHz frequency band operates between 2.4 to 2.4835 GHz. Open-air range up to 600 feet, line-of-sight. Indoor range dependent upon environment with 300 feet common. Low power radio systems are dependent upon interference levels from other radio systems and environmental conditions. Radio devices are not suitable for all applications. 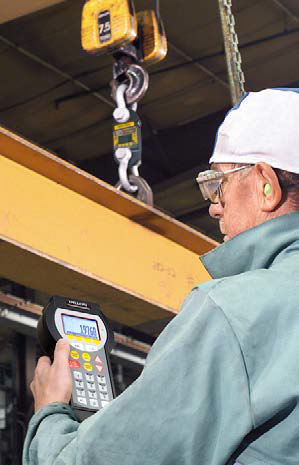 * Dillon calibrates with shackles installed and cannot guarantee accuracy with other installations and/or hardware. The shaded capacities reflect instruments with bearings installed (in the dynamometer body where shackle pin acts as inner race) and if alternate hardware is used, the pin should be machined to identical specifications. Option S includes centering spacers where required. Option P includes spacers and attaching hardware for both upper and lower shackles. All include certificate of calibration, manual and batteries. Plastic carry case included for EDx-1T to EDx-50T. Higher capacities include rugged plywood storage crate.Display backlight. * Normal resolution mode with Dillon provided shackles(not included).